Real Estate Investment Trusts (REITs) are the best and easiest way for income investors to profit from rental properties without any of the hassle, paperwork, or illiquidity that goes with personally owning real estate. Of course, now that interest rates are rising for the first time in nearly a decade, many investors are concerned about whether it’s a good time to invest in this high-yield sector. Fortunately, the highest-quality REITs have proven track records of growing in all manner of economic and interest rate environments. None more so than Federal Realty Investment Trust (FRT), which is one of America’s oldest REITs and has grown its dividend every year since 1967 (49 years and counting) at a very impressive average annual rate of 7.4%. In fact, Federal Realty is the only real estate company in the dividend aristocrats list here. Let’s take a closer look at Federal Realty to see just if this company deserves to be considered one of the world’s best high dividend stocks and a worthy candidate for a diversified income portfolio. Founded in 1962 in Rockville, Maryland, Federal Realty is one of America’s (and the world’s) oldest REITs. It has traditionally specialized in high-quality, neighborhood shopping centers anchored by grocery stores and located in large, highly affluent markets. Federal Realty owns 98 properties totaling 23 million square feet. However, the biggest growth potential for the REIT lies in premium mixed usage retail properties, in which retail is combined with residential, office, and hotel components and rented to high-end retailers that are least at risk of being disrupted by e-commerce from giants such as Amazon (AMZN). That’s why Federal Realty also owns over 1,800 premium apartments in some of America’s fastest-growing and strongest rental markets. When it comes to well-managed, long-term focused REITs with a history of consistent dividend growth, Federal Realty is literally the best in the REIT industry. In fact, its record of 49 consecutive years of unbroken annual payout growth means that in 2018 the company will become the first and only REIT dividend king. 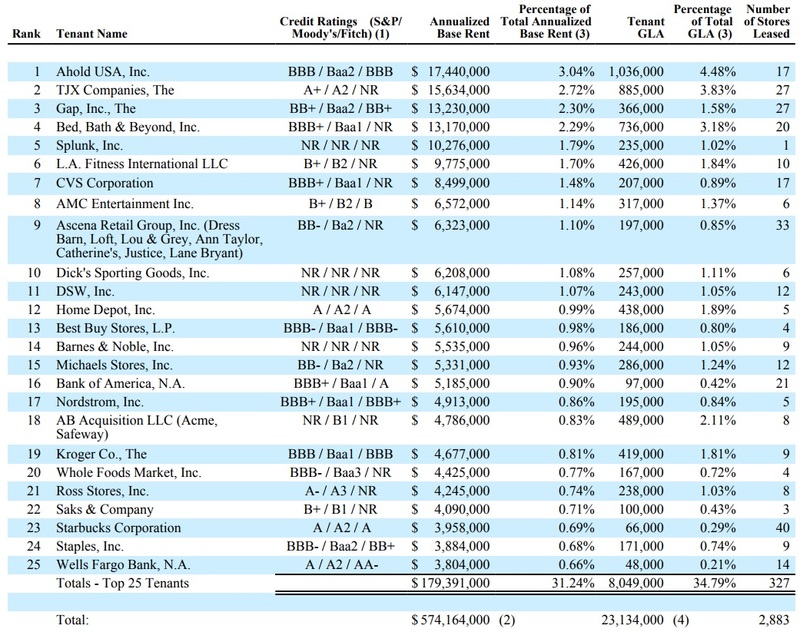 Investors can see all of the dividend kings here. 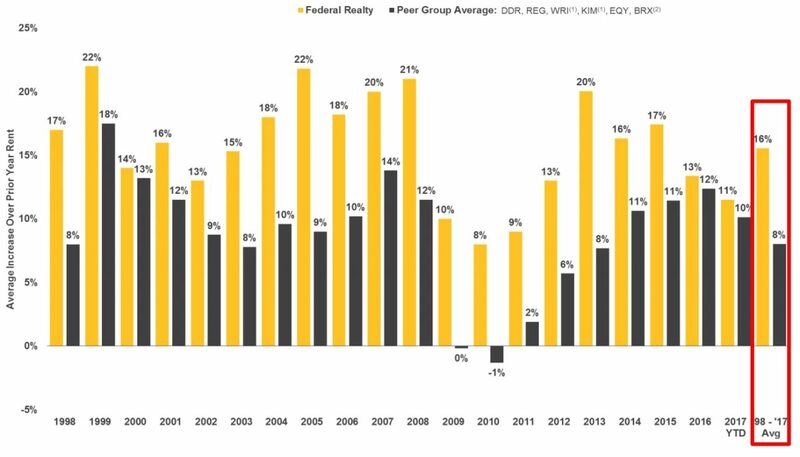 Federal Realty has been able to achieve such consistent performance in all sorts of economic and interest rate environments (including interest rates of 22%) thanks to its conservative culture and triple net lease business model. Specifically, that means that Federal Realty’s tenants pay all taxes, insurance, and maintenance costs, and Federal merely sits back and collects its high-profit rent, which is under very long-term leases (average remaining lease is 8 years). That creates highly consistent and recurring funds from operation (FFO), which ultimately pays the company’s highly secure and steadily growing dividend. Of course, given the fact that the REIT industry is highly commoditized, the fact that management has been able to build several key competitive advantages is also key to the long-term success story. Management believes this five-part strategy will enable the REIT to achieve 5% to 7.25% annual FFO growth over the long-term. In fact, over three quarters of the company’s properties are located in these core markets. The second quality factor is management’s disciplined approach to maintaining and improving its properties, in order to attract more premium tenants and achieve higher lease rates. Management has been able to achieve impressive 8% to 9% returns on investment for this kind of “tactical redevelopment” historically. That’s because, combined with the premium locations of its properties, its more upscale focus has allowed it to achieve, by far, the best rental rates in its industry. Even better? 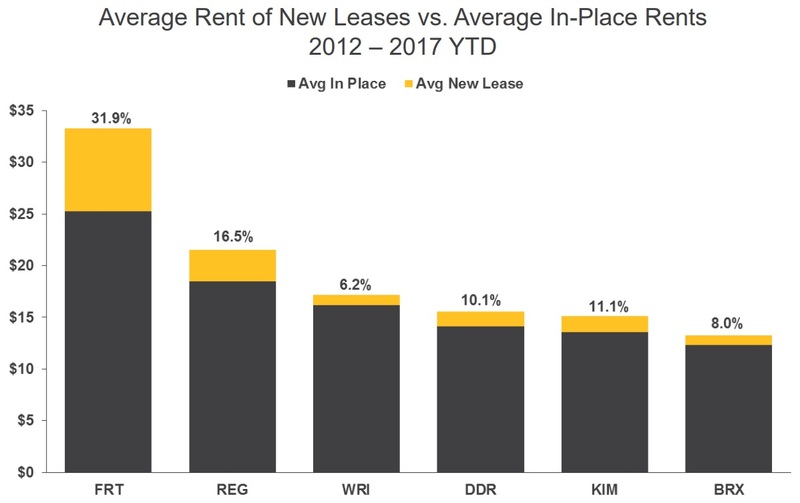 Federal Realty has been able to maintain high occupancy (95%) with these high leases, and even grow them at impressive rates, far quicker than its peers. More important is that this strong increase in leases is a long-term trend, not just the result of a strengthening economy over the past five years. 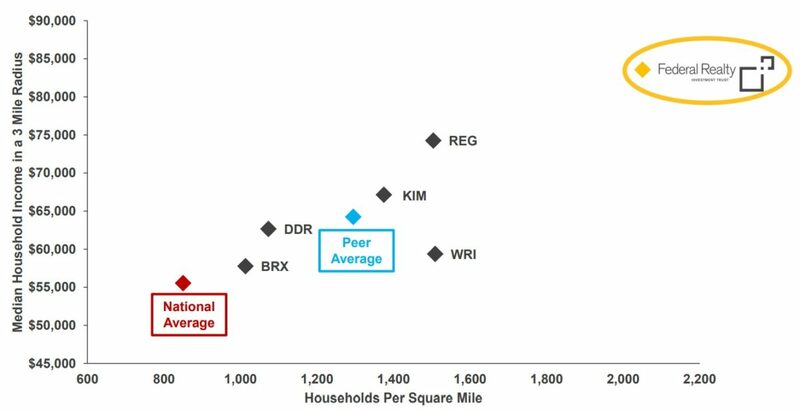 As you can see below, management has been able to grow its rental leases by double the rate of the industry average over the last two decades. And given that the new leases signed in the past year have averaged $35 per square foot, this impressive trend is likely to continue for some time – even despite the current turmoil in brick-and-mortar retail. Combined with disciplined new property acquisitions, these steadily rising rental rates have allowed Federal Realty to post strong and consistent sales increases in what is otherwise a slow growth market. 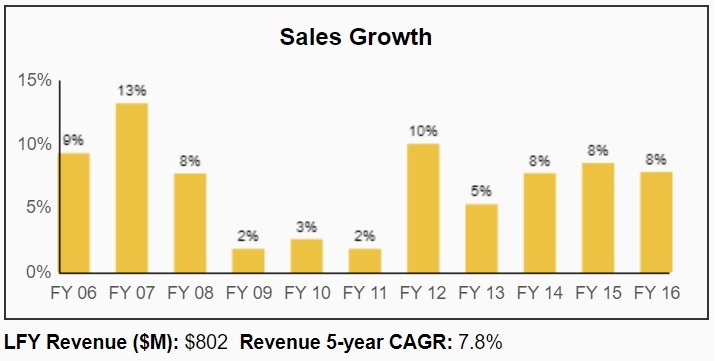 Next, management uses strong cost discipline and growing economies of scale to convert that sales growth into steady and even improving margins and returns on capital. In fact, thanks to its premium focus, Federal Realty enjoys the highest profitability in its industry, including a 51% FFO margin. That means that just over half its revenues are available to help fund its dividend. The final component of its long-term growth strategy is also the most important competitive advantage any REIT can have – a very low cost of capital. A low weighted average cost of capital (WACC) is critical to long-term growth because of how the REIT business model is structured. Legally, REITs can avoid corporate taxes if they pay out 90% of taxable income as unqualified dividends, which explains the industry’s high dividend yield. As a result, unlike most corporations, which fund growth through retaining profits and cash flow, REITs must fund most of their expansion through external debt and equity markets (i.e. selling new shares). In other words, external capital is always flowing into a REIT, meaning that it can be challenging to determine how well management is using shareholder’s cash. Is the REIT really maximizing long-term shareholder value? Or merely growing for the sake of growth (and increasing management’s salaries)? The two best ways to determine this are to look at the trend in FFO per share over time, as well as whether or not a REIT’s return on invested capital (ROIC) is greater than its cost of capital. A high-quality REIT will be careful to only buy new properties (and upgrade its existing ones) if it results in shareholder accretion. In other words, marginal FFO will be greater than the shares sold to help finance any improvement to, or acquisitions of, new properties. That ensures that FFO per share, which ultimately funds the dividend, is increasing. In order to be able to make accretive capital allocation decisions a REIT needs access to low cost capital, of which there are three sources: retained FFO, debt, and equity. As you can see, Federal Realty has a very even split between these three capital sources. Combined with very low costs of debt (courtesy of its industry-leading balance sheet) and a rock-bottom cost of equity (due to a high share price premium), the company has bountiful access to some of the cheapest capital in all of the real estate sector, and much lower than its ROIC. That helps ensure that this REIT is building long-term shareholder wealth, thanks to very strong capital allocation decisions by one of the best management teams in the business. It’s no accident that Federal Realty’s capital costs are so low across the board. For example, retaining such a large amount of FFO means that not only is the dividend protected by a large safety buffer, but also that FRT can minimize shareholder diluting equity issuances, which makes it easier to grow FFO per share and the dividend more consistently and faster than its peers. Meanwhile, the cost of debt is mostly determined by the stock’s credit rating, which at A- is tied for the second highest of any REIT. That required management to take a long-term, disciplined, and conservative approach to debt, including not over-leveraging itself in the last eight years when interest rates were at their lowest levels in history. 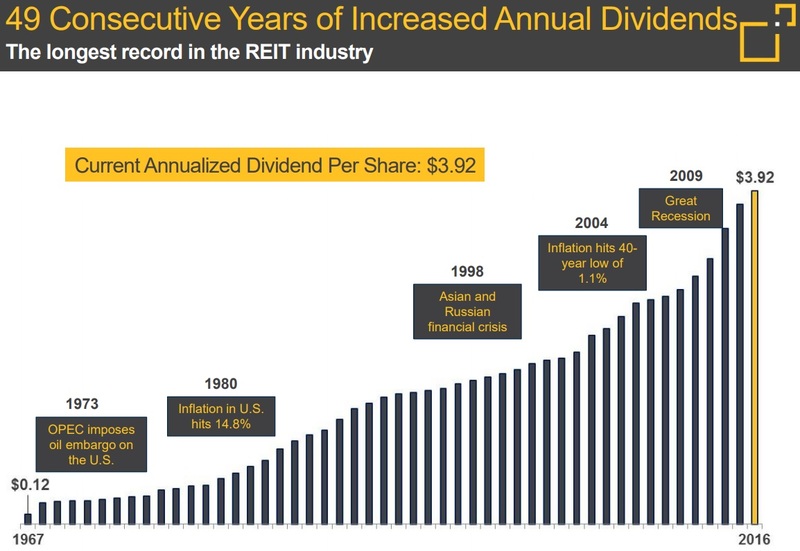 Finally, the low cost of equity is precisely because Federal Realty’s long-term dividend growth record has made it the gold standard of not just retail REITs, but global REITs in general. In other words, due to its strong and consistent growth, which has allowed FRT shares to generate double-digit annual total returns over the past two decades, Wall Street is giving this stock a well-deserved premium that ensures it access to some of the cheapest capital in the industry with which to keep growing. Overall, Federal Realty’s high quality property portfolio, focus on large and affluent markets, conservative balance sheet, low cost of capital, and long-term dividend growth track record make it one of the highest quality REITs in America. While Federal Realty, with its unbeatable history of steady and impressive growth, seems to be a relatively low-risk stock, there are nonetheless three main risks to be aware of. 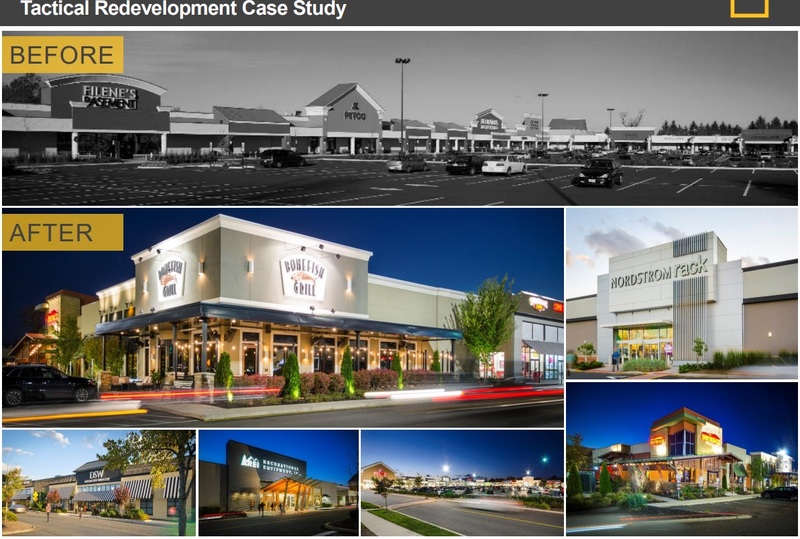 First, the majority of the company’s growth pipeline rests in mixed use properties. 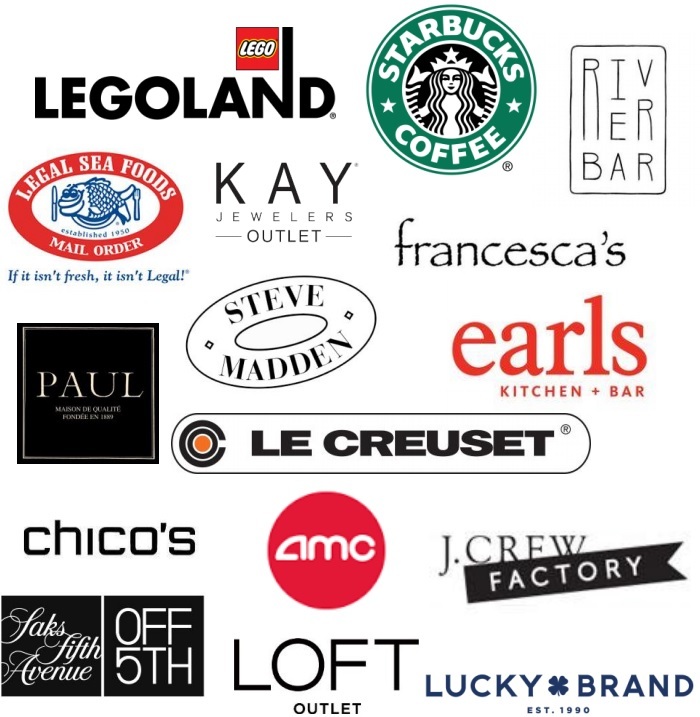 Specifically, there are 15 properties that management wants to develop and believes can achieve 8% to 9% returns on investment while expanding its leasable retail space by 74%, or 17 million square feet. However, the thing to remember about these projects is that they are far more complex that most retail only properties. In particular they require numerous partner developers to help finance the hotel, office, or apartment components of the properties. 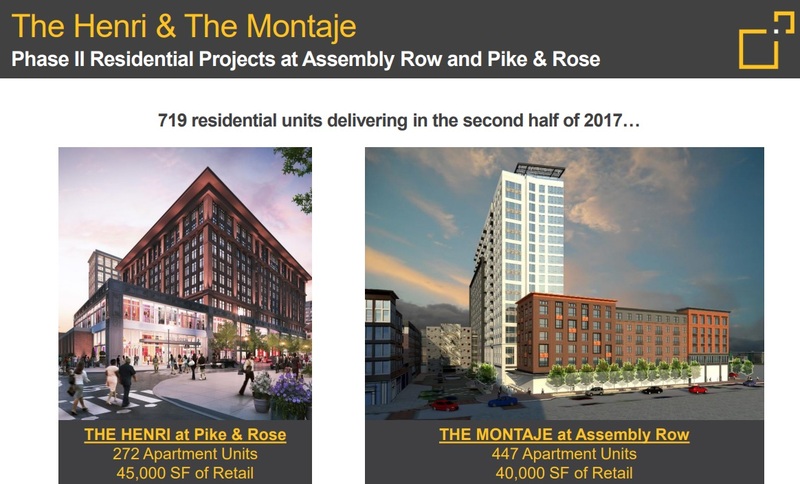 Which means the risk is that some of these projects may end up faling through, especially if an economic downturn results in the REIT’s business partners not being able to line up the funding to complete their components of the joint ventures. Next is the risk that long-term changes in consumer retail preferences might ultimately might hurt many of the REIT’s tenants. Because while high-end retailers, with stores located in very high density and wealthy areas, may have continued to do well in the age of Amazon thus far, there’s nothing guaranteeing that this trend will continue. After all, many wealthy folks have Amazon Prime and enjoy shopping online, especially as the company expands its premium offerings and speeds up deliveries to as fast as one hour in certain large cities. Finally, we can’t forget that rising interest rates, while not a death knell to the REIT industry, can still hurt its short to medium-term growth prospects. That’s because REITs are one of the most interest rate sensitive equity classes, due to their need for constant infusions of new external capital. 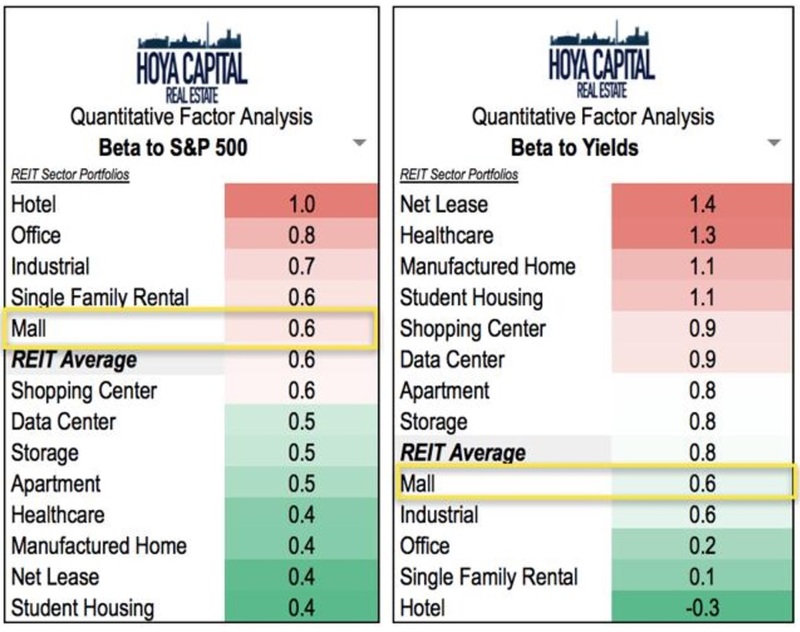 In fact, mall REITs have an average beta to yield of 0.64, meaning that for every 1% increase in 10-year U.S. Treasury Yields, their dividend yields can be expected to rise 0.64%. If the Federal Reserve’s long-term forecast of a 2% increase in long-term rates by the end of 2019 is correct, that would mean that Federal Realty’s yield could rise to 4.4%, potentially resulting in nearly a 20% share price decline. While long-term investors wouldn’t be harmed by this (in fact they’d benefit from better yields on new capital and reinvested dividends), shorter-term, more risk averse invetors, such as retirees living off the 4% rule, could be more significantly impacted and should keep this risk in mind. The good news is that for long-term investors, either those who are 10+ years away from retirement, or retirees funding all of their living expenses with dividends, is that even in a higher rate environment, Federal Realty should still be able to grow, despite an increase in its cost of capital. That’s because FRT’s high profitability means that even in such a scenario, its cost of capital would still likely allow for accretive (though possibly slower) growth. Federal Realty has a Dividend Safety Score of 80, meaning that its dividend appears to not only be highly secure and dependable, but also one of the safest dividends in all of REITdom. That’s not surprising given the company’s impressive 49 year dividend growth streak. What explains Federal Realty’s dividend safety? Three main factors. The first is the highly dependable cash flow provided by long-term rental agreements with a highly diversified group of high-quality tenants. You can see that most of the company’s 25 largest tenants have investment-grade credit ratings and are spread across different industries. 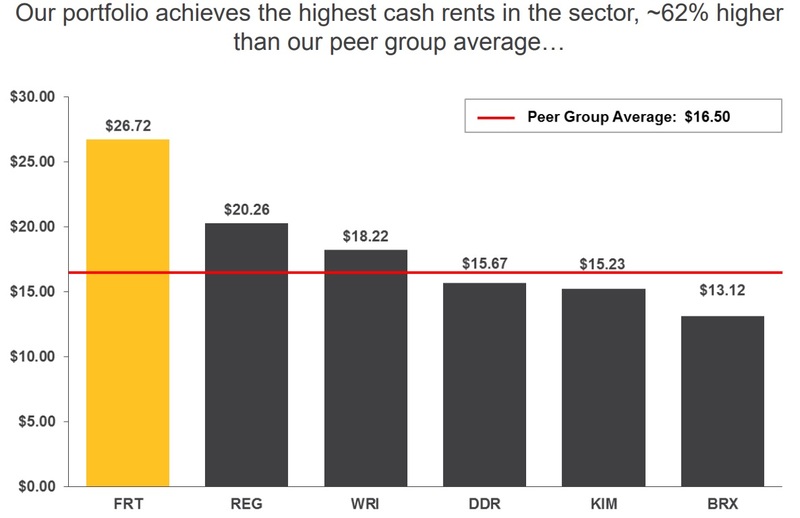 Federal Realty’s top 25 tenants combined also only make up 31% of its total rental revenue, and no tenant exceeds 4% of total annualized base rent. That helps ensure that any individual distressed retailer, such as one that goes bankrupt and thus stops paying rent, doesn’t end up hurting the REIT’s cash flow enough to threaten the dividend. That’s because of the second protective factor, the very low FFO payout ratio, which management generally keeps around 70%. This conservative payout ratio not only helps the company retain its low cost of capital (because retained FFO is free) but also helps to ensure steady and secure payouts even during times of economic distress, such as the financial crisis. Finally, Federal Realty’s dividend is protected by its strong balance sheet. At first glance, the REIT’s high leverage ratio and negative free cash flow may make it seem like FRT has too much debt, enough to potentially threaten the payout. However, remember that free cash flow is calculated by subtracting all capital expenditures, including growth that’s funded by external sources. In other words, because of the capital-intensive nature of the REIT industry, one in which lots of debt is both expected and necessary, we need to keep debt metrics in perspective. And when we compare Federal Realty’s debt levels to its peers, it becomes obvious that it’s actually one of the safest stocks in the industry. That’s courtesy of the below average leverage ratio (net debt/EBITDA) and low debt to capital ratio. This explains the company’s very strong credit rating, which gives the REIT such a low cost of debt and helps with its low overall cost of capital. In addition, it’s important to be aware of two other metrics, the interest coverage ratio and the fixed-charge coverage ratio (operating income/interest and preferred dividends). A good rule of thumb is that you want a REIT to have values of at least three for both metrics, indicating that cash flow is easily covering short and medium-term liabilities. FRT’s interest rate coverage ratio of 5.5 is one of the highest of any REIT, and its fixed-charge coverage ratio has not only been above three pretty much during its entire history, but has actually been steadily growing in recent years. In fact, the fixed-charge coverage ratio is now among the strongest in its industry and helps to explain why its dividend growth has been so much better than its lower-quality (more highly leveraged) peers over the past decade. The fact that many of its peers have negative dividend growth rates over the past 10 years, due mostly to having to cut their payouts during the financial crisis, is a testament to both the importance of a fortress-like balance sheet and FRT’s conservative use of debt over the past half century. Federal Realty’s Dividend Growth Score of 36 indicates that investors could see somewhat below average (relative to the S&P 500’s 20-year median payout growth of 5.7%) dividend growth in the future. That’s not that surprising given that FRT has become famous for its slow but steady pace of dividend increases. Of course, given that management has generally maintained a very steady FFO payout ratio of about 70%, which is where it currently sits, the dividend is likely to grow at about the same pace as FFO per share going forward. Fortunately, management’s long-term strategy should be able to achieve about 5% to 7% growth in net operating income and FFO, meaning that the payout should rise at approximately that pace. Over the past year, concerns over rising interest rates and a bear market in retail REITs have caused Federal Realty to underperform the S&P 500 by about 40%. As a result, the stock’s current price/adjusted funds from operation, or AFFO (the REIT equivalent of free cash flow, and a far more appropriate valuation metric than a P/E ratio), is 26.4, which is below its long-term historical average of 30.1. Of course, that’s still much higher than the industry average of 19 and among the highest of any equity REIT. 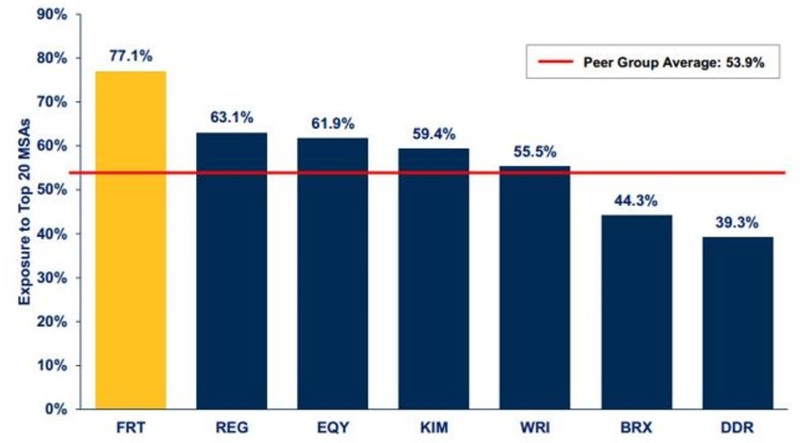 However, given its strong fundamentals and the fact that FRT is a year away from becoming a dividend king, this blue chip REIT is likely always going to command a strong price premium. From a yield perspective, FRT’s current dividend yield of 3.1% (a three-year high), though one of the lowest in the overall REIT sector, is still above its long-term historical yield of 2.9%. The bottom line is that Federal Realty, as one of the best REITs in the world, will likely always have a relatively low yield as far as REITs go. However, with potential long-term annual total returns of 8.1% to 10.1% (3.1 % yield + 5% to 7% annual earnings growth), FRT is still a potentially solid income growth investment at today’s relatively depressed price. 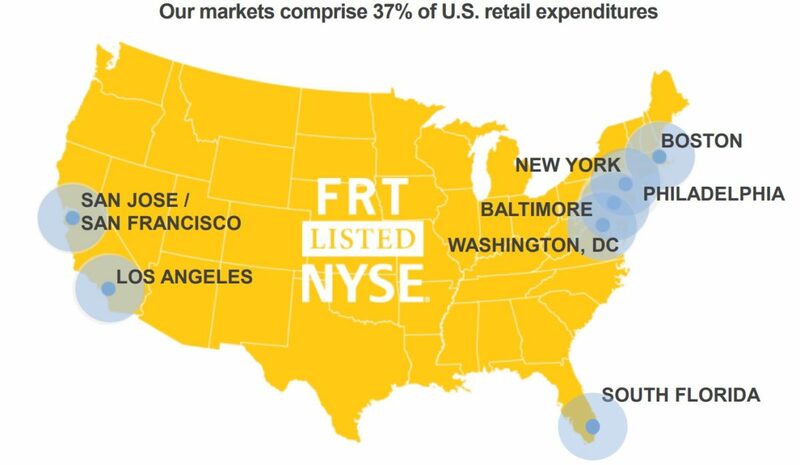 The biggest wildcard is future growth in the brick-and-mortar retail industry, but FRT’s diversified tenant base and unique focus on high-end consumers have served it well thus far. Federal Realty’s impressive dividend security, fortress-like balance sheet, long dividend growth streak, and conservative management team make it one of the highest quality REITs in the market. The stock’s sharp underperformance over the past year makes Federal Realty a more timely long-term income growth investment to consider as well, at least for investors willing to play the role of contrarian in brick-and-mortar retail. Investors who are looking to take advantage of the dip in retail-related REITs but want even less exposure to Amazon-targeted tenants might also review National Retail Properties (NNN), a high quality, higher-yielding REIT trading near its 52-week low.